Dai Andrews holds four world records for sword swallowing, including swallowing a saber blade that is curved 120 degrees from point to hilt. In addition, his show may feature the swallowing of two 24″ blades, one of which is curved from side to side in a serpentine, (known as a Kris type blade). 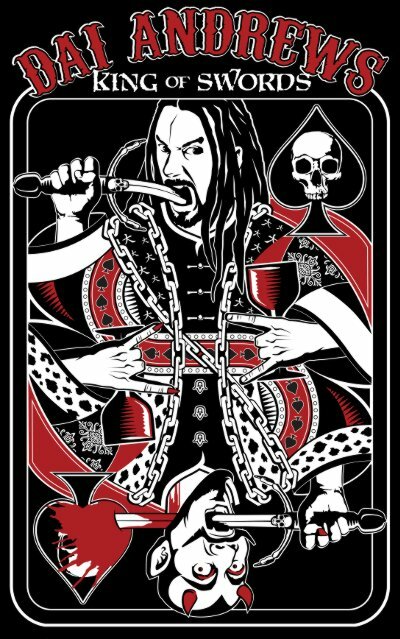 He also swallows a 12″ dagger, a set of up to 15 swords that he swallows all at once, a 2′ long pair of forceps, glowing neon tubes, needles, and other strange and unusual objects. 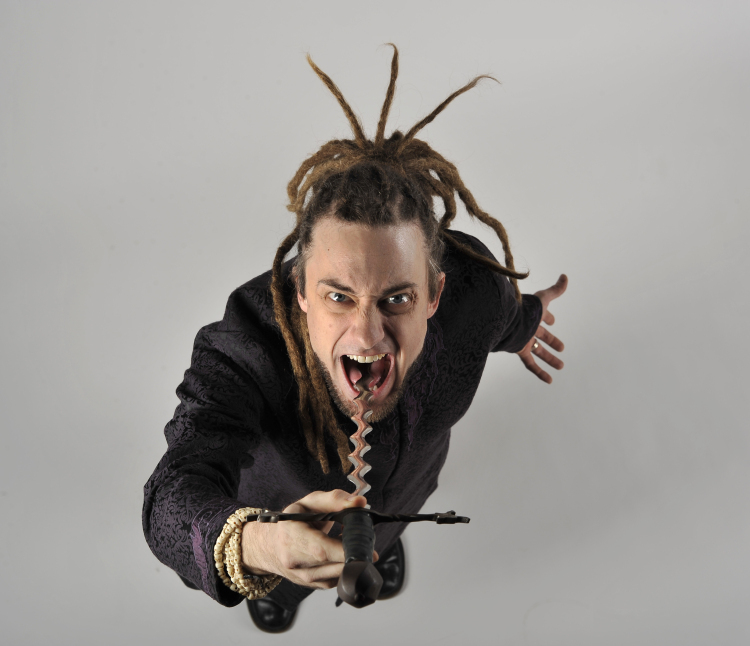 Dai Andrews exclusively performs the swallowing of a Red Hot Sword that he heats with a blowtorch live onstage! Sword swallowing has always been a misunderstood art form, and has constantly suffered from the misconceptions that it is a magicians trick. Even those who understand that it is real often have vast a misunderstanding of the techniques employed. For example, even the virtually omniscient Encyclopedia Britannica’s definition is full of half truths, and misinformation. Webster’s Third New International Dictionary of the English Language, Unabridged; defines a Sword Swallower as “a performer who pretends to swallow a sword or some other rigid object.” Nothing could be further from the truth. In fact sword swallowing is quite real, it is a deadly art with a long and colorful history. Greatest curve 120 degrees Dai Andrews Only five sword swallowers swallow a blade with any curve at all. Longest sword 33 inches George the Giant At 7′ 4″ tall George has big advantage. Most swords swallowed at once 52 Red Stuart Wow. Most Sword Swallowers Swallowing Swords Simultaneously 19 Dai Andrews and 19 others. A total of 50 swords were swallowed, Dai swallowed 11. Most Swords Swallowed Simultaneously 50 Dai Andrews and 19 others. A total of 50 swords were swallowed, Dai swallowed 11. Single Sword Swallowed by the Most Sword Swallowers 33 “Sword of Swords” The “Sword of Swords” initially swallowed at the first S.S.A.I. Convention, where Andrews along with 20 others inaugurated the blade, it has since been swallowed by at least twelve others. 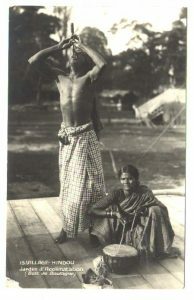 Sword swallowing seems to have originated about four thousand years ago in India. There, the art was developed by magician/priests, known as fakirs or sadhus and was used as a demonstration of invulnerability, proof of the priests connection with the gods. In fact most forms of entertainment including; magic, drama, and music were religious practices strongly tied to shamanistic traditions. As an interesting and related side note, Native American Shaman seem to have independently developed the art of sword swallowing. The shaman would swallow either a long stick or an arrow to prove his strength and endurance. It was practiced along side the handling of venomous snakes, hot coals and other “ascetic” religious practices. From India, sword swallowing spread to Greece, China, and the rest of the world. Throughout the ancient Roman Empire sword swallowing could be seen at festivals like the Ludi Florales, (the games in celebration of Floralia, the festival to the flower-goddess Flora celebrated at the end of April and beginning of May). 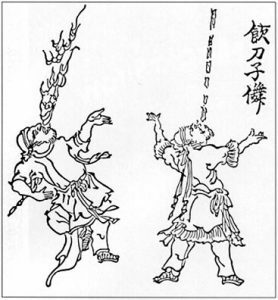 The practice of sword swallowing also traveled north into China in the 8th century, as evidenced by this illustration from Xin Xi Gu Yue Tu, written in the T’ang Dynasty (AD 750). Sword swallowing was popular in Japan in the 8th century and was often seen as part of an acrobatic form of theater known as Sangaku, which also featured juggling, tightrope walking and other related skills. Sangaku like Gigaku, and other forms of drama popular in Japan popular prior to the 11th century, traces it origins to southern China, and then back to India, and possibly Greece. However, in Japan unlike India, the art was associated with theater as opposed to religion. From Greece and Rome, sword swallowing spread across Europe at the hands of medieval Jongleurs; street performers who would travel the countryside performing in barns and public squares. In the middle ages, sword swallowers, like magicians, jugglers and other entertainers were often condemned and persecuted by the church. Seen as witches and devil worshipers, they were often imprisoned, tortured or killed. Still, in most places they were welcomed by the common folk, and the tradition of the wandering entertainer remained strong, despite the danger posed by the church. Fortunately, by the mid 17th century, performers could once again wander more or less freely, and they became common sights on street corners and at festivals across Europe. Saint’s day festivals were extremely popular throughout Europe in the 17th, 18th and the first half of the 19th century. These festivals were part carnival, market, circus and theater all in one. There, one could find almost any form of novelty or a amusement know to man. Either set up in tents, or on open air stages, it was quite common to see magicians, jugglers, fire eaters and of course sword swallowers demonstrating their skills. By the mid 1800’s however the fairs began closing down as patrons deserted them in favor of proper theaters. In the 1900’s sword swallowing found a new home in the American side show, and for many years sword swallowers were numerous. They would travel with circuses, side shows and carnivals across America and around the world. There, the art prospered like never before. For a time circus was the most popular form of entertainment in America, and sword swallowing was a part of it. As its bond with the side show grew, the art’s history and connections to theater and religion were forgotten in the western world, and sword swallowing became the sole property of the side show. 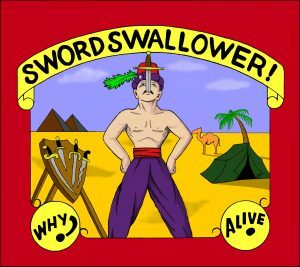 For a wonderful description of what life in the side show was like for a sword swallower, and what it is like to learn to swallow swords, read Memoirs of a Sword Swallower, by Daniel P. Mannix. Unfortunately the golden age of the circus is long past. In the 1950’s, with the increasing popularity and cost efficiency of mechanical rides at carnivals, one by one the side shows began to disappear. The sword swallowers had lost their home, and there numbers began to dwindle. 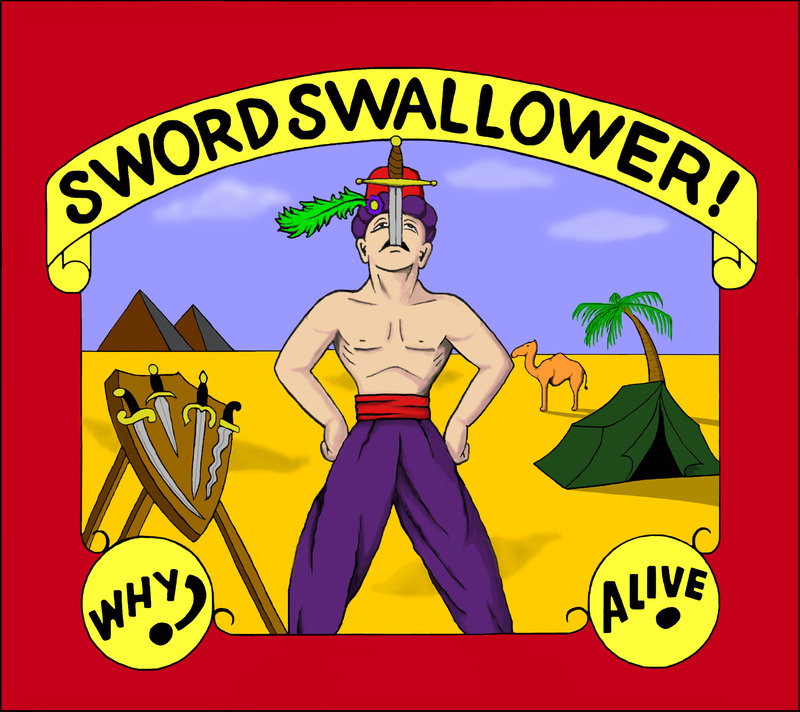 Today there remain fewer than one hundred sword swallowers in the entire world.